This item is the first issue (Vol. I No. 1) of what was intended to be a quarterly publication. It is not clear if more than this issue were published. The publication supported the Farmer's Alliance and the Populists. It was published by James H. Lathrop of Oberlin and later Oakland, Kansas. The publication contains information about the Alliance Produce Company of Topeka, Kansas, which was an attempt to store and market farm products based on the Alliance sub-treasury plan. 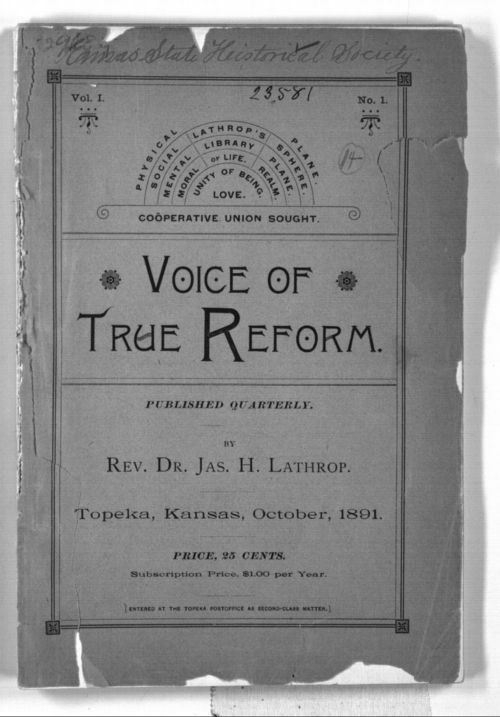 It describes the proceedings of Alliance Commercial convention held in Topeka on August 20-21, 1891. The volume also contains articles by various authors related to Farmer's Alliance and Populist issues. A "Local and Personal" section begins on page 83, and contains notes about various Alliance and Populist activities in Kansas.